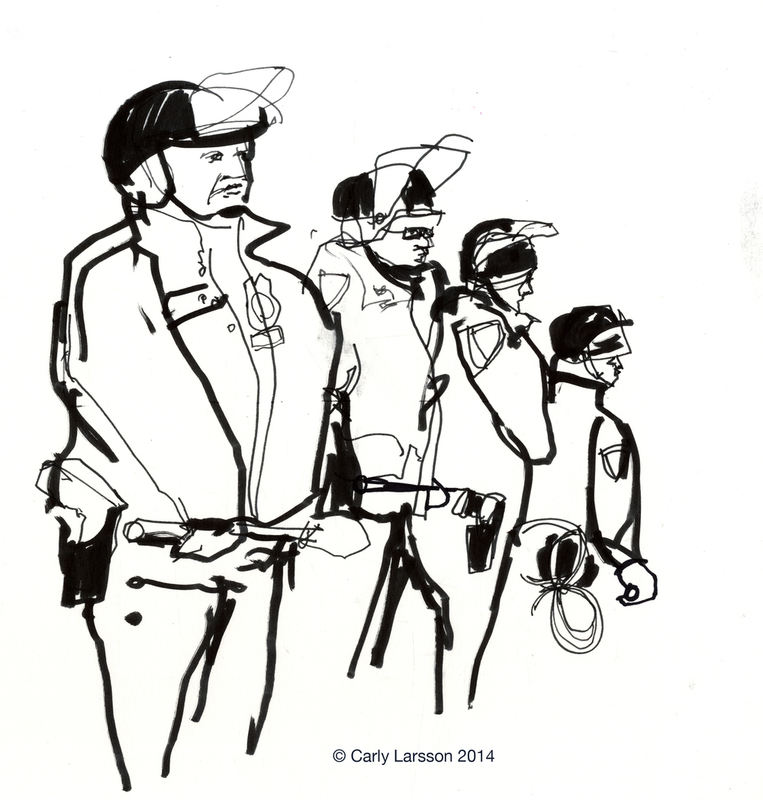 Last night I attended the Millions March protest for Eric Garner at Foley Square to do some reportage illustration with friends Audrey Hawkins, Evan Turk and Chris Brody. When we arrived there were already hundreds of people gathered; the square was packed and people were spilling into the streets. The atmosphere was peaceful but charged with a kinetic, positive energy. It was heartening to see how many different people turned out to demonstrate. There were parents with children, teenagers, college students and elderly people of every race and gender. People were chanting "Hands up don't shoot" and "No justice no peace." I overheard a mother shout out “hands up!" and her toddler yelled "Justice!” I had to laugh. Protestors in Foley Square in front of the United States Court House. Soon we began to move toward the entrance to the Brooklyn Bridge, with protestors chanting "Eric Garner, Michael Brown, shut it down shut it down!" and "Racist, sexist, anti-gay, NYPD go away!" Once we got to the entrance to the bridge we stopped; I heard that police had blocked entry to the bridge. I was at the very tail end of the group, behind police who had formed a line standing shoulder-to-shoulder. They started to back up as I drew; one bumped into me and apologized. There were news crews, photographers and journalists everywhere, as well as a few different helicopters circling overhead shining spotlights down on the crowd. Some other chants I heard were "Indict, convict, send those killer cops to jail! The whole damn system is guilty as hell!" and "How do you spell racist? N-Y-P-D!" One guy even had a saxophone that he played the whole time we marched, though as I began drawing him he was lost in the crowd, so unfortunately he doesn't make a cameo here! Protestors attempting to gain access to the Brooklyn Bridge. Some protestors had made large cardboard cutouts of bodies that looked like chalk outlines. Each one had a name of a black person killed by the police. Some people had megaphones, but the crowd chanting in unison seemed to be the most impactful. For a large group, the protestors marched fast. While Audrey and I said goodbye to Chris and Evan, the crowd disappeared down Centre Street. We found them again on Broadway, where they had taken over the street and traffic was at a standstill. Then we turned and marched up Canal Street. Protestors march down Canal Street toward the Holland Tunnel. This adorable little girl riding on her dad's shoulders had made her own sign. It was a bit scribbly and hard to read, but I think it said something about paying reparations to the families of those killed by police. While a few motorists/commuters seemed irritated, most were actually cheering on the protestors. A few cars and trucks beeped their horns to the beat of the chants, some people put their hands up as we walked by, and a few work crews had made signs saying "Ferguson is everywhere" that they hung in the windows of their trucks! As the crowd moved toward the Holland Tunnel, Audrey and I decided to hang back and draw some of the scary-looking cops in riot gear. They were standing shoulder-to-shoulder holding their batons out in front of them, and had economy packs of plastic handcuffs at the ready. The leftmost cop in the drawing below said I made him look fat. NYPD in riot gear lined up along Canal Street. In addition to the hundreds of cops on the streets, there were hundreds more in vans following the protestors. It seemed like overkill for such a peaceful protest, and I definitely noticed that many of the cops were treating bystanders/commuters (and us, with our sketchbooks) with more respect than they showed the protestors. While we were there, it seemed like the police were, for the most part, standing back and letting the protestors do their thing. However, just after I left I saw photographs and reports of police indiscriminately arresting and pepper-spraying people, including children and elderly women. Not exactly the best PR move for them, considering the protest was for ending police brutality, but I guess they got bored of standing around. In all, it was a wonderful and moving experience. It was so inspiring to see all the different people that came out on such a cold night to demand reform and an end to police violence!